2007 marks the 150th anniversary of the opening of Mrs Elizabeth Ann Mattingley's Infant School in her double-storey weatherboard house at 18 Errol Street, near where Errol's Bakehouse Pantry operates today. One year later, her 21-year-old son Albert, a trained National School teacher, opened an Upper School for older pupils in a single-storey iron building on the corner of Errol and Queensberry streets, a few doors north of his mother's Infant School. This building was rented from Albert's father, John Thomas Mattingley, a cabinet-maker from Reading, England, who emigrated with his large family in 1852 and moved into the first residence erected in the area. They are therefore considered by many as the founders of North Melbourne. The schools combined to form the Errol Street National School No 206, Hotham. The Upper School building quickly proved inadequate for the large number of pupils attending the school and in 1859 Mattingley built two new brick schoolrooms on the west side of Errol Street, next to the present National Bank building. Mattingley Lane, running north from Queensberry Street, behind where the school was once situated, commemorates this important pioneer of education in North Melbourne. Prior to 1862 there were also several Denominational Schools in the North Melbourne area. On 1 September 1862, the Denominational and National Schools combined to become Common Schools. With the introduction of the Education Act in December 1872, which made education compulsory and free for all between the ages of six and 15 years, the Errol Street Common School No 206 became the Errol Street State School. Fifteen months later, in May 1874, the school moved into new premises at the bottom of Errol Street, designed by architects Wharton and Vickers. Their design was to become the inspiration for the design of other state schools in Victoria. 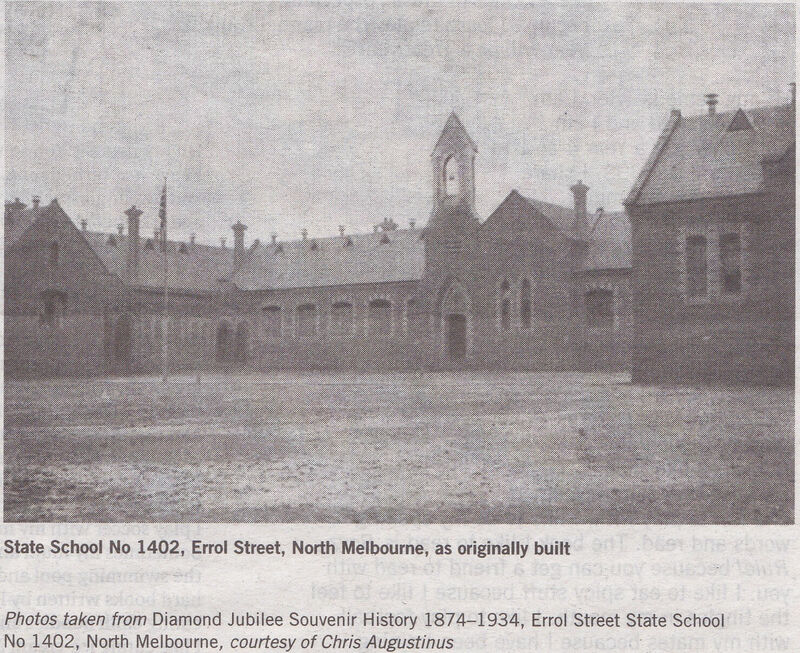 The school building still exists today, with modifications and extensions, as the only government primary school servicing the North and West Melbourne area. Albert Mattingley was appointed the first head teacher of the new Errol Street State School No 1402 and remained there until he retired in October 1894. Albert Mattingley was a highly respected educator (at the time of his resignation, he held the premier position on the Triennial Roll of Teachers, ie the first of the first class of the Victorian state school teachers). He was also a fine amateur historian. His address to the Royal Historical Society of Victoria on the history of North Melbourne is the most comprehensive, accurate and graphic contemporary account we have of the early years of North Melbourne's foundation. In recognition of Albert Mattingley's enormous contribution to North and West Melbourne, our favourite thespian and Hotham History committee member, Father Jim Brady, will read excerpts from this address at a Hotham History Project event in June.